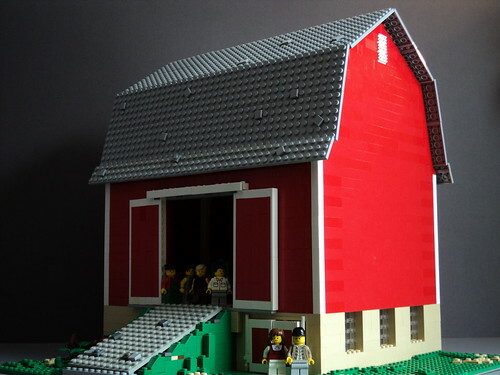 Brick Town Talk: Classic Red Barn - LEGO Town, Architecture, Building Tips, Inspiration Ideas, and more! This took me about two months to produce. It originally started out with a really basic roofless frame of the building with any sort of brick I could find—mostly yellow and blue. From there I counted the pieces I needed and ordered a good amount of red 1xX bricks. Another order soon followed to complete the roof and grass. By far the trickiest/irritating bit of this whole model was the top most roof sections. They can't just sit on there, or else they slide off, pushing the middle roof section off in the process. So I had to place them on little hinges, which worked pretty well, aside from the fact that they leave little gaps near the top. I'm really happy in how this turned out. I've never built a barn before, and now I finally have! Thank you! I like your barn as well, I believe I have seen it before.